"little-old-ladies-in-no-apparent-distress" (a LOL in NAD - to quote Samuel Shem). She had a bit of leg swelling - thought to be because of her heart failure - and perished, unnecessarily, of an undiagnosed DVT with subsequent pulmonary embolus. Hard luck, you may say. Not so. Her blood tests clearly showing she had a clot and the result had been wrongly entered in the notes as "Normal". Gertie was among many hundreds of thousands of people who are damaged by the "Four Harms" identified by the NHS as the most frequent avoidable causes of damage: VTEs (like Gertie), Catheter UTIs, Falls and Pressure Ulcers. In fact, the most recent statistics show clearly that these four harms alone affect 6 - 7% of all hospital admission. 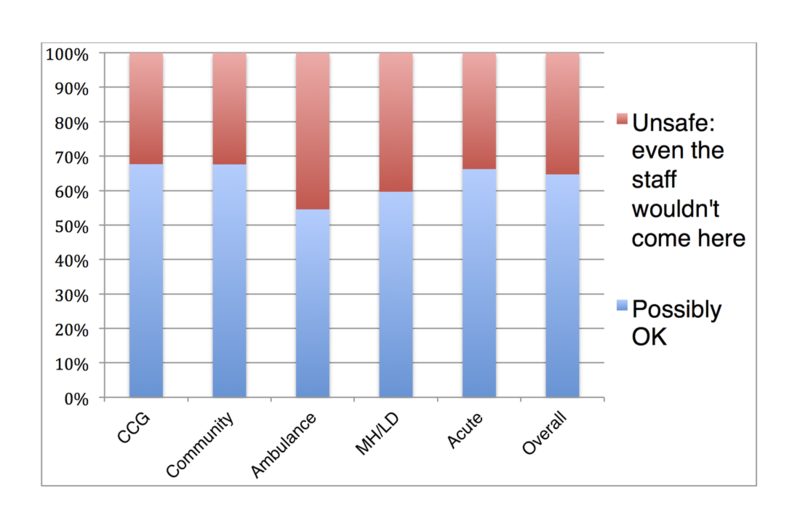 Other estimates suggest we needlessly damage 1 in 10 or more of our inpatients, LOLs in NADS being at particular risk. The real figure is may be much higher. Not good, you may say. And you'd be right. And - what's more - we healthcare workers know it. If you ask any healthcare worker, in any of the NHS institutions they'll be able to tell you a story from the last week where something bad happened to a patient: a fall, a missed diagnosis, a healthcare acquired infection ... lapses, mistakes and slips. Some through active mismanagement, some through latent errors. Which is why, presumably, with the fastidiousness known only to idealists, the DH has insisted that every NHS worker in the country be asked if they would recommend the care of their institution to a friend or relative (yet another extension to the infamous, and totally dotty "Friends and Family" test). "The survey shows steady progress on improving staff experience and growing confidence in the quality of care. NHS Employers has welcomed the results as a vote of confidence in the service." Great ... Oooh! But just wait a minute. Friends of Jon Moon will be alert to a naughty info graphic trick. Did you notice that scale? Ending on the right at 80%, tempting you to be complacent about how good this pictures is. How about we display the graph like this instead? Still want to dial 999? "Hang on", I hear you cry. "Thats unfair. Standard of Care includes lots of things, like how good the food is and whether people smile. It's not just about safety". I'll ask that question again. Really? 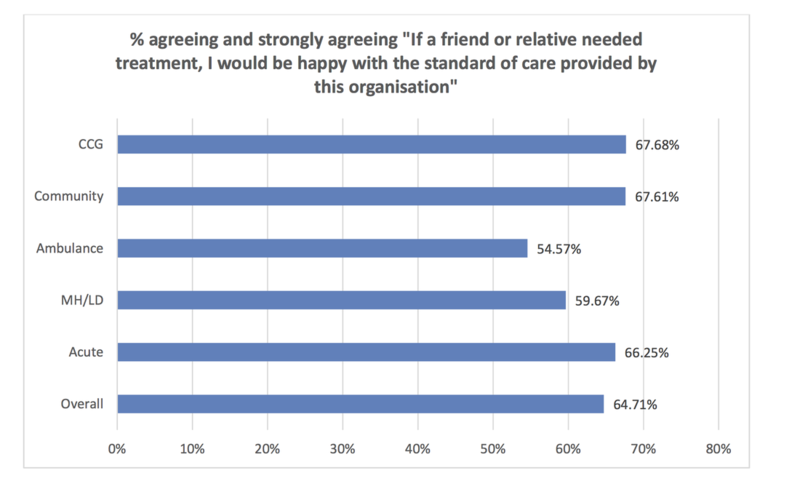 If you are asked about standards of care, what do you think about? The food? The car parking? Or do you think about hand hygiene, effectiveness of handover, quality of clinical decision-making, levels of staffing? "But really this answer probably reflects people's overall enjoyment of their job", you may say. And I would counter: Is that really different? If you don't enjoy your job, is it really because you don't like the lighting or the decor? Or is it more likely that you think you're in a place which is, overall, not doing a GOOD job and that you are not doing the job to the standard that you would wish. A sense of quality (for which read safety) and job satisfaction are - shock - correlated. So, what is the DH and NHS doing about this situation? The answer is that they are continuing to fund and encourge great work on patient safety and of course, they employed Don Berwick to write a report. But as far as staff are concerned, they are continuing to do nothing very much except trying disguise the awful truth (now ruthlessly exposed by the devastatingly accurate info graphic above). Next year, we can be sure we will have another staff survey which tell much the same story. "So, Mr Clever Cloggs", you may ask, "Well done for shooting the messenger. What would you do about it?" We need so much more than a yearly staff survey. We need trusts to seek-out and take action on stories from staff - concentrating on the positive but taking note of the problems. Everyone needs to be congratulated and reinforced in the behaviours we applaud and the issues that staff see every day need to be brought to the attention of the senior clinical leaders in way that is safe for staff. The NHS needs a monthly barometer which addresses the issues that make nearly half of them say they wouldn't want to be treated where they work. All material in this website is licenced under a Creative Commons Attribution-NonCommercial-ShareAlike 3.0 Unported License. (In brief, this means you can use it all, for free, providing you attribute it to us - and don't try to make any money out of it). Downloading any material from this website implies acceptance of this licence.